HC Institute director, Pietro Michelucci, led a multidisciplinary group of world experts in the emerging field of “human computation” in Washington, DC last week to consider the unprecedented capabilities that might arise from crowd-powered systems and to map out the research needed to get there. The workshop itself employed human computation techniques in service of its own goals, such as participatory gaming, workflow execution, group composition, and interaction mechanics. Through these methods, workshop participants explored human motivation in participatory systems, worst-case scenarios, mapped out high impact success cases, and iteratively developed new human computation solutions to societal problems to help identify research gaps and inform related national policies. The three-day workshop, held at the Woodrow Wilson International Center for Scholars, was proposed and co-organized by the Human Computation Institute, Cornell University, and the Wilson Center, and funded by the Computing Community Consortium (CCC). 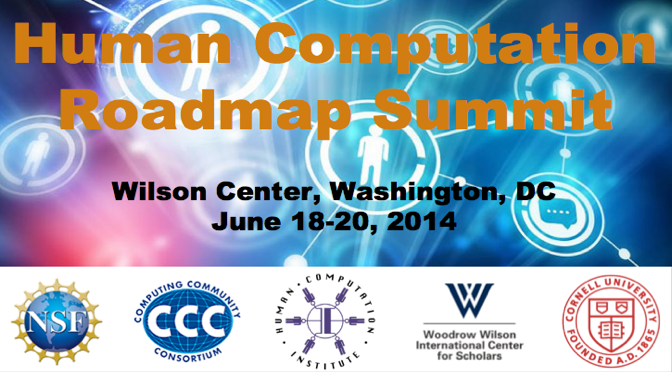 A workshop report, under development by the co-organizers and community of participants, is expected to be published by the CCC in early 2015.